Finally getting my week sorted out to get to this green smoothie post, and have to mention that blogging this morning it feels different. See, hubby got Julie & Julia from the library and we watched it over the last few nights (it sometimes takes us a few nights to get through a movie)! Delightful movie, we loved it. And, how we laughed through some of the scenes, feeling we have lived out the moments... like publisher rejections, the elation of getting a book deal, finding the "perfect title" for a cookbook, blogging about life amongst recipe testing, arguing about if something is suitable to 'blog about', and more! It was surreal to watch and feel these parallels. Now blogging this morning, it has a different feel for me. Isn't that strange? I've been doing this for over five years! Okay, let's get to it! Making a green smoothie. 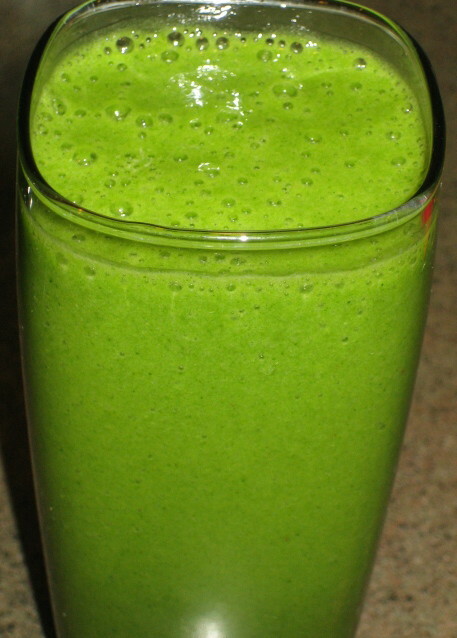 If you're new to green smoothies, the idea of taking inherently bitter, sometimes fibrous and stringy greens, and pureeing them into a drink might be weird if not downright disgusting! But, what you will soon discover, is that when you blend greens like spinach, kale, or chard with sweet fruits like bananas, apples, mangoes, oranges, and/or pineapples, you truly don't notice the taste of the greens. The sweetness of the fruit predominates. It's smoothie magic! Here, I'm giving you green smoothie tips along with some suggested 'recipes'. Though, the recipes are very loosely defined, as once you get into the swing of these drinks you will eyeball the greens and fruit and get a good sense of proportions and combinations. Choose your greens. My favorite green to use is kale. It is robust, stores well in the fridge for a few days, and is very nutritious with more absorbable calcium and iron that greens like spinach and swiss chard (see Becoming Vegan for more on calcium and iron in greens). But, spinach and swiss chard still offer many nutritional benefits, so definitely try them out. Also, since spinach and chard are milder in flavor than kale, they are good “starter” greens for the uninitiated. You can also experiment with other greens and lettuces, though I wouldn’t recommend spicy greens like arugula or mustard greens in a smoothie – they are just too strong and peppery. Save those for your sautés and salads! Wash and stem greens. Some greens like kale can hold more grit, so fully submerge the greens in a sinkful of water, then rinse and shake off excess water. (Be sure to dry your extra greens before refrigerating. Use a salad spinner or shake to dry well. Once mostly dry, I store in the fridge by loosely wrapping in a dishtowel, and then placing inside a large ziploc bag (leave unzipped). I find the greens keep well for a couple of days, they don't get soggy and rot, and they stay nicely crisp.) Then, for greens like chard and kale, you want to separate the leaves from the thick stems. Holding the leaf in one hand, run your fingers of your other hand down the length of the stalk to separate the leafy portion from the fibrous stem. The more tender parts of the stem (at the tops) will usually tear away with the leaves, and this is okay - they are tender enough. Fruits to use – sweet and some frozen! Adding sweet fruits will balance the bitterness of the greens. Bananas are an obvious choice because most of us have them on hand, they ripen easily, and also add creaminess to the drink. Greenish bananas are not welcome here, get out! Let your bananas over-ripen, and then peel, slice, and store them (in large ziploc bags or in other containers) in your freezer. If you aren't overly fond of bananas, try frozen mangoes. They are very sweet, and also lend a subtly creamy texture. I keep bananas in my freezer, and regularly buy bags of frozen mangoes. Either or both combine well with other fruits – and those not frozen – for a delicious smoothie. Other fruits that work well in your smoothie include ripe pears, seedless grapes, pineapple, sweet apples and oranges, and honeydew melon or cantaloupe. These are usually kept at room temperature (though grapes are a great fruit to freeze, just not commonly kept frozen), and so combining with some frozen fruit is optimal. Including some frozen fruit of any kind nicely chills your green smoothie. I’ve had room temperature smoothies, and they aren’t as pleasing as those with some chill factor. If using bananas or mangoes that are fresh and not frozen, you may want to add ice cubes in place of water for your blending, to chill your drink, as using all room temperature fruits will give you a warm-ish smoothie! Avocados will also add a creamy texture – but not much sweetness - try adding ½ of an avocado to your mix and see how you like it. Can’t leave the fruit topic without talking about berries! Fresh or frozen strawberries, blueberries, and raspberries… of course, delicious in a green smoothie, and so nutritious! The only thing you need to know about using red or purple berries is that the color of the smoothie changes. No longer will it be a vibrant inviting green color, but rather a more swampy brownish color! But, if you can ignore the color aesthetic, by all means, include some berries. On the other hand, if you want to 'mask' the green color (for children - or adults), then frozen blueberries, blackberries, or acai pulp work magic. Another fruit that can be included is avocado. Technically a fruit, though not often thought of as a fruit because it isn’t juicy or particularly sweet. But, it can add a luscious creaminess to your smoothie, so try adding ½ of an avocado to your mix and see how you like it. Add-ins Smoothies are the perfect place to get in nutritious bits and bobs that you might otherwise find tricky to include in your diet. Seeds like hemp, flax, or salba, or something like goji berries or spirulina. A high-powered blender like a Blendtec really does the best job with hard seeds and fruits. It will pulverize salba seeds and gojis to smithereens! But, a standard blender will do fine with hemp seeds. Also consider adding a tablespoon or two of a smoothie infusion powder, to add extra flavor and also nutritional value. I really like Vega’s Shake & Go “Tropical Tango” and “Vanilla Almondilla", and typically add 1-2 tablespoons to my smoothie blend, choosing a flavor to complement the fruits used in the smoothie. Blending. Blend the heck out of your smoothie! Make it really smooth, not still grainy or chunky or with bits of leaves floating about. No, blend mad! It can be thick, as you can always thin with water, but definitely needs to be smooth. If using a standard blender, you will need to blend for a couple of minutes. Blend until the greens are so pulverized that they are no longer visible other than infusing your smoothie with a beautiful green color. If using a high-powered blender like a Blendtec (vrrooom! ), simply run the whole juice cycle, and if needed, pulse again after if any chunks of frozen fruit remain (I typically have to give it an extra whirl with the frozen fruit). Kale leaves can take longer to fully blend than spinach or chard (especially depending on your blender). I find that frozen fruits like banana and mango also help the blender cut through the greens. Add enough water to get the mixture moving and smooth. Start with a modest amount, maybe 1/3 cup, and use more as needed. Taste test. After blending, dip in a spoon to taste test before serving up. If you need more fruit to balance the sweetness… or water to thin, do so. Once you've made enough of these (again, whether with this recipe or just adding to your own smoothies), you'll probably skip this step, as you'll have a sense of proportions needed. So, you’ve got the general idea, and here are some examples of smoothie combinations that I love. But, know that this list is by no means exhaustive! There are so many combinations, you just need to play around to find your favorites. I’m including kale here as the base green, just because it’s the one I use most and is a green that offers the most absorbable calcium and iron. Certainly chard or spinach can be substituted for kale. These suggestions should yield two pretty large smoothies, but measurements are quite approximate, so modify as you need. 1. Kale leaves (about 1 ½ cups), frozen banana chunks (about 1 1/2 cups) , one apple (core removed, skins intact), one orange (peeled) 1 -2 tbsp hemp seeds + enough water to get it moving and thin out if you like. 2. Kale leaves (about 1½ cups), frozen banana chunks (about 1 cup), frozen mango chunks (about ½ - 1 cups), 1 orange (peeled) or ½ cup fresh pineapple (cubed), 1-2 tbsp Vega Mango-Tango Smoothie Infusion, 1 tbsp salba seeds + enough water to get it moving and thin out if you like. 3. Kale leaves (about 1 ½ cups), frozen bananas chunks (about 1 - 1 1/4 cups), 1 large or 2 small apples (core removed, skins intact), frozen mangoes (about 1/2 - 3/4 cup), + enough water to get it all moving. 4. Kale leaves (about 1½ cups), frozen banana chunks (about 1 ½ cups), fresh or frozen strawberries (about 1 cups), 1 apple, 1-2 tbsp Vega Vanilla Almondilla Smoothie Infusion, 2 tbsp goji berries + enough water to get it moving and thin out if you like. 5. Kale leaves (about 1½ cups), frozen banana chunks (about 1 ½ cups), fresh or frozen blueberries (about ½ cup), 1 apple or pear, 1-2 tbsp flax seeds + enough water to get it moving and thin out if you like. 6. Kale leaves (about 1½ cups), frozen banana chunks (about 1 – 1 ½ cups), honeydew melon (cubed, about ¾ cup), 1 orange or ½ cup fresh pineapple (cubed), ½ avocado, + enough water to get it moving and thin out if you like. Great post! My husband and I have been drinking green smoothies for almost 2 years now and we LOVE them! What a great way to start your day. Our favorite smoothie contains kale, spinach, flax meal, chia seeds, apple, banana, lemon and some mixed frozen fruit! Delicious! Collard greens are also mild in flavor and not high in oxalates. Collards are super easy to clean, too. I use the Lacinato kale for my kale because there are are fewer 'ruffles' to clean. I add a pinch of kelp powder to add some iodine and a couple raw cacao beans to add some anti-oxidants. I add flax if I'm not having my usual oatmeal w/ flax for breakfast. Increase the liquid a little if you use flax because it will thicken the smoothie. I also like to use a bit of apple juice in my smoothies, i.e. 1/4 cup. Yummy stuff. My Vita Mix blend rocks. Thanks so much for this post! I thought I had to have a fancy blender to add greens when all along I just wasn't waiting long enough for the blender to do its thing. Green smoothie first thing tomorrow! Great post on the Green Smooties, this is a daily habit of mine & I add in wheat grass powder, great start to the day! Thanks, Dreena! Frozen peaches are great too. Also, if I need to sweeten my smoothie just a little, I add a splash of apple juice. Oh gosh, green smoothies make me swoon, and so does this post. THANK YOU for the bright green, spring - like colour on the screen. Totally comforting! yum! I love green smoothies. My favorite combo is frozen pineapple, banana, a little unsweetened coconut milk and kale. In the summer, I like banana, frozen peaches, kale and a little bit of OJ. Oh! How excited am I to get a green smoothie into my system for tomorrow's breakfast?! Thanks for the great recipe Dreena. If I have heaps more energy soon I'll know who to thank! PS - Julie & Julia is a great film! It was one of the things which inspired me to start blogging in the first place. This is a fantastic post, of course i'll have to admit i'm biased, i'm a huge fan of green smoothies, keep drinking them, the health benefits are incredible. Great help for making green smoothies! Thanks! If you don't mind, I'd like to translate to spanish this post in my blog (obviusly quoting you everywhere). I think this a very helpful information and I want to spread it. I love your blog! everything looks yummy and tasty! (p.s. To Elisa, thx for that reminder. I use collards too, but sometimes they aren't as fresh and plentiful at our hfs... But you're bang-on, they aren't too strong and the calcium/iron are more available, as you mentioned re the oxalates. I need to get to updating my post to include this too!). Very good instructive article. 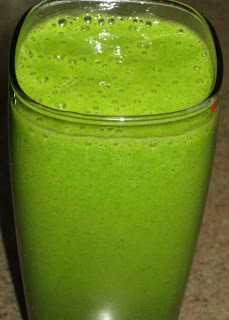 I don't think green smoothies were around when I recovered from chronic fatigue with intensive juicing many years ago. Now I have given up my juices for Green Smoothies. I look forward to one every morning and don't feel right without one. Green smoothies are awesome. I absolutely swear by them. In my life Ive never come across anything that so very naturally helps you lose your taste for junky food as a green smoothie. By drinking one a day for even a week, your cravings for bad foods simply disappear! Green smoothies 4 eva! I tried your recipe today, and it was so yummy! Great way to include greens in your diet!